St Bloggie de Riviere: Fancy an astronaut ice-cream cornet? 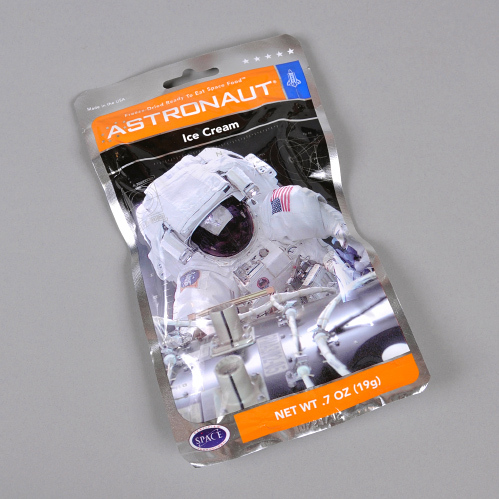 Fancy an astronaut ice-cream cornet? When I was about the age of my eldest, my mother bought me some astronaut ice-cream to put in my Christmas stocking. It came in a flattish plastic packet and made a peculiar scrunching noise when I prodded it. It apparently did not need water to re-hydrate the freeze-dried slab inside, but, according to Wikipedia, was "brittle and rigid but still soft when bitten into". I put it away for a rainy day and forgot about it. When I did eventually dig it out, I was dismayed to see that it had long passed its use-by date, so it went into the bin unopened. I think I'd thought that as it was basically dry, it would be edible for years and years. In fact, disappointingly it went off after two. This was how most freeze-dried food was produced until demand increased for longer lasting packs. Freeze-dried food is used by the army, astronauts, sailors, adventurers, emergency teams, NGOs and so on. It is also being stocked by survivalists. Oh, just a few nut-jobs in the wilds of the US, then... Well, no, freeze-dried food is becoming big business, and not just in the US. There are keen survivalists in the UK and Germany too, and the phenomenon has spread to France. People are stocking up against economic, social or natural catastrophes where survival would be an issue because distribution routes could become paralysed. Last year, the website lyophilise.fr sold 85,000 meals to individuals here anxious about the future. At between €4.50 and €6.50, that's a lot of money. One guy bought €30,000 worth of provisions. There is no typical customer - couples, families, singles are all at it, discreetly so as not to avert their neighbours. Food today is delivered to shops from highly centralised centres of distribution. As strikes have shown, it doesn't take much to disrupt this system, and you get folk running around like headless chickens buying up trolleys full of pasta, flour and oil heedless of the needs of others. The concept of sharing goes out of the window the moment a whiff of emergency is felt. When the first Iraq war was declared, my French granny-in-law urged me to lay in stocks of vital foods, having lived, as she had, through the War. I went to the supermarket on my normal shopping day to find the shelves empty of basic foods. I wondered if the panic buyers would be able to use their stocks before they actually went off. Frankly, I hoped not. People who are stocking freeze-dried food understand that they cannot necessarily count on the system when there is a serious problem. Tinned food has a short life span despite what many people think (how many old tins have you got lurking at the back of your kitchen cupboards, eh? I recently threw out a bag full...), but freeze-dried food is now being made that can last for ten to twenty-five years. You can buy all sorts, from breakfast packs to full meals, desserts, snacks and even packs which self-heat. You're a vegetarian? No problem, there are meat-free meals too. A pack of month's worth of food for a family will cost about €1500, the only problem is they all seem to be halal. I haven't worked out why this might be. Are Muslims more likely to buy in packs of stocks, or is it because they have more disasters and so possibly consume more, or is it a marketing ploy to ensure a maximum number of potential sales (except Jews?)? I am very much against halal so if I were to invest (! ), I'd have to become a vegetarian or buy individual meals. My DB asked me if we should buy some to put away (er, where?). He already has a small stock of soap (no soap - no cleanliness - rapid death... with soap you are king) and other necessities just in case. I tried to get worked up about the idea... and failed. Sales figures might be doubling or more every year, but I have enough trouble keeping the present running smoothly let alone worrying about the future. We'll probably all be nuked by the Iranians anyway and it won't matter how much stuff we've got in the garage. Pouf! Gone.